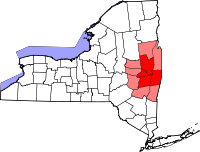 Location in Rensselaer County and the state of New York. East Greenbush is a town in Rensselaer County, New York, United States. 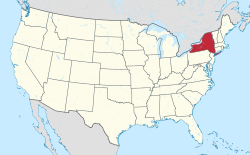 It is a suburb of Albany, New York. The population was 16,473 at the 2010 census. The word Greenbush is derived from the Dutch het groen bosch, referring to the pine woods that originally covered the land. The first settlement of the land now known as East Greenbush was made by tenants under patroon Kiliaen van Rensselaer circa 1630. The town was established in 1855 as Clinton, and was renamed in 1858. It is mostly suburban along its major highways and rural in the southwestern and northeastern corners. Interstate 90 traverses the town. It contains the west (or south) end of US Route 4 and the northern terminus of NY Route 9J; as well as US Route 9 and US Route 20. The latter are concurrent, under the name Columbia Turnpike, and is often referred to by the locals as "9 and 20." East Greenbush was part of the Manor of Rensselaerswyck, and Albany County prior to Rensselaer County's creation in 1791. The town of Clinton was established on February 23, 1855 from the town of Greenbush at the same time as the town of North Greenbush. Three years later, on April 14, 1858, the town name was changed to East Greenbush by New York State Laws of 1858, Chapter 194. The town originally included land (including Fort Crailo) that was annexed to the City of Rensselaer in 1902 and is now the industrial and residential south end of the city. Early settlement along the Hudson River shoreline occurred around 1628/9 and in 1669 a fort was built on Papscanee Island. The hamlet of East Greenbush was settled around 1630, with a Dutch Reformed church first built in 1787, and a post office was established in 1845. In the late 18th century until his death in 1834, Prospect Hill on Hays Road in the southern section of the town was home to Edmond-Charles Genêt, former adjutant-general, minister plenipotentiary, and consul-general to the United States representing France; and as an American citizen he was a New York state legislator from Rensselaer County and a major-general in the state militia. The town's main thoroughfares are quite old, starting with the old post roads constructed during the French and Indian Wars by the English. The Boston and Albany Turnpike was constructed in 1800, today known as the Columbia Turnpike designated as US Routes 9 and 20. Another major highway in the town, the Farmer's Turnpike also was built at or before this time, today it is NY Route 9J. The town saw at least one memorable event during the Anti-Rent War which was a popular revolt among tenants of the last patroon of Rensselaerswyck over rent payments. A deputy sheriff named Griggs was killed in the line of duty while evicting a man by the name of Witbeck from his farm. The area of East Greenbush behind the Town Hall was the site of a huge cantonment, occupied by over 5,000 soldiers during the War of 1812, this included a hospital, barracks, and an arsenal. Along the Hudson River near Papscanee Island in the mid-late 19th century a large farm was occupied by Colonel Kiliaen van Rensselaer, great-grandson of his namesake and first Patroon of Rensselaerswyck, Kiliaen van Rensselaer. In the late 1980s, the descendants of the original Dutch settlers on Papscanee Island came under pressure from suburban development in the area, and the Open Space Institute purchased large parcels of land and development rights to surrounding areas, creating the Papscanee Preserve. [obsolete source] In 1997 the county took charge of management and the park has been developed with informational signs, trails, picnic areas, and a central theme dedicated to the Mohican natives of the areas. The John Carner Jr. House and Craver Farmstead are listed on the National Register of Historic Places. According to the United States Census Bureau, the town has a total area of 24.4 square miles (63.1 km²), of which 24.1 square miles (62.4 km²) is land and 0.2 square miles (0.6 km²) is water. The western section of the town along the Hudson River is marked by bluffs that rise to an elevation of between 100 and 300 feet. The little flat land that exists along the river is on the Papscanee Island. Papscanee Island is actually a peninsula, separated from the rest of the town by the Papscanee Creek. The town then spreads out as rolling hills rising towards the east. Mill Creek (formerly Tierken Kill) and Morden Creek are the principal streams of the town. East Greenbush is bordered by the town of North Greenbush to the north, the town of Sand Lake to the east, and the town of Schodack to the south. To the west the town borders the city of Rensselaer from the North Greenbush line to southern tip of the city, then East Greenbush's border is with Albany County town of Bethlehem, the border being in the middle of the Hudson River. Citizen Genêt, French ambassador to the United States during the French revolution who generated strong opposition against George Washington by the Democratic-Republicans over American foreign policy and was eventually granted asylum by Washington when yet a new French government arose and sent him an arrest, which basically meant a death sentence for him should he return to France. Jennifer Farley, television personality, MTV's Jersey Shore, is a graduate of Columbia High School. Artie "the strongest man in the world". According to the 2000 census, there were 15,560 people, 6,084 households, and 4,185 families residing in the town. The ethnic composition of the town was 94.01% White, 2.85% Black or African American, 0.13% Native American, 1.94% Asian, 0.02% Pacific Islander, 0.29% from other races, and 0.76% from two or more races. Hispanic or Latino of any race were 1.33% of the population. The East Greenbush Central School District comprises five public elementary schools (Bell Top Elementary School, in North Greenbush, Genêt Elementary, Green Meadow Elementary School, Red Mill Elementary School, and Donald P. Sutherland Elementary School), a private Catholic school (Holy Spirit School), and a Montessori school (Woodland Hill Montessori School), a middle school (Howard L. Goff Middle School), and a high school (Columbia High School). The East Greenbush Community Library serves nearly thirty-thousand patrons in a chartered district which includes the town of East Greenbush and portions of the town of Schodack. The library is a member of the Upper Hudson Library System, a resource-sharing consortium consisting of twenty-nine public libraries in the counties of Albany and Rensselaer. In 2001, the library moved from the East Greenbush Town Hall to its current location on Michael Rd. August Gate — A large neighborhood on Red Mill Road (NY 151) west of Couse Corners, accessed via Robert Lane. Avian Meadows — A neighborhood west of Best on Best Road, north of Werking Rd, accessed via Avian Drive. Best — A hamlet in the northeast part of the town near the east town line at the junction of Best and Best–Luther roads (CR 53 and CR 55). Clinton Heights — A suburban neighborhood in the west part of the town. Clinton Park — A suburban neighborhood located along Sherwood Avenue, west of Hampton Manor. Couse Corners — A hamlet located at the junction of US 4 and NY 151 north of the hamlet of East Greenbush. East Greenbush — a hamlet and designated place located on the Columbia Turnpike (US 9 / US 20) near its junction with US 4. Governors' Square East — A neighborhood belonging to a home owners association, located along 3rd Avenue Extension, accessed via Rockefeller Boulevard and Plaza Avenue. Hampton Manor — A suburban hamlet and census-designated place in the west part of the town. Luther — A hamlet on Route 151 and east of East Greenbush and south of Best. Onderdonk Estates — A large neighborhood located along Columbia Turnpike (US 9 / US 20) located east of Hampton Manor and west of Sherwood Park. Plaza View — A neighborhood located along 3rd Avenue Extension, east of the Rensselaer City/East Greenbush town line. Prospect Heights — A suburban neighborhood in the west part of the town. Sherwood Park — A suburban neighborhood south of Columbia Turnpike (US 9 / US 20) and west of Phillips Road (CR 57). Woodland Park — A suburban neighborhood south of Columbia Turnpike (US 9 / US 20) and east of Phillips Road (CR 57). ^ Gannett, Henry (1905). The Origin of Certain Place Names in the United States. Govt. Print. Off. p. 112. ^ a b c d e f George Baker Anderson (1897). "History of East Greenbush". D. Mason and Co. Retrieved 2010-01-29. ^ a b "East Greenbush" (PDF). The Legislative Gazette. November 8, 2004. Retrieved 2010-01-29. ^ a b "Papscanee Island". Open Space Institute. Retrieved 2010-01-29. ^ "Environment Today". Rensselaer County. Archived from the original on May 18, 2009. Retrieved 2010-01-29. ^ a b J.H. French (1860). Gazetteer of the State of New York. p. 557. Retrieved 2010-01-28. ^ Talar, Amanda (2010-02-23). "JNormal to JWOWW - Amanda Talar". Blog.timesunion.com. Retrieved 2014-01-13. ^ "VIDEO - Jwoww teen / high school photos: She graduated high school a year early; had a black belt in martial arts". Starcasm.net. 2010-07-09. Retrieved 2014-01-13. ^ Dec 1, 2011 (2011-12-01). "Reality Stars That Have College Degrees?". Hot 107.9 Philly. Retrieved 2014-01-13. Anderson, George Baker (1897). Landmarks of Rensselaer County New York. Syracuse, New York: D. Mason and Company. OCLC 1728151. Weise, Arthur James (1880). History of the Seventeen Towns of Rensselaer County from the Colonization of the Manor of Rensselaerwyck to the Present Time. Troy, New York: J. M. Francis & Tucker. OCLC 6637788. Wikimedia Commons has media related to East Greenbush, New York.